Our panel of experts will address juvenile justice and child welfare strategies to expand effective community-based services and keep more children in their home communities with families or in family-like settings where they are most likely to thrive. The strategies seek to ensure that the use of more institutional settings — such as state lock-ups and residential treatment centers — is limited, brief, and effective. This discussion will cover policy solutions related to leveraging new funding available through the Family First Prevention Services Act (FFPSA) to divert CPS-involved families from foster care, preparing for new funding restrictions to institutional care settings under the FFPSA, capacity building lessons from community-based foster care, opportunities to keep youth from going to deeper into the juvenile justice system, and more. We look forward to seeing you on December 3rd! 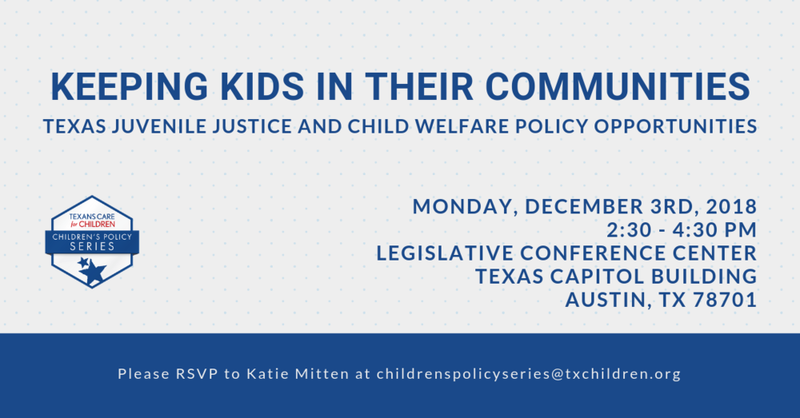 Children's Policy Series: How Will Texas Kids Fare in the Next Legislative Session?